Multiple grand tour stage winner Michael Matthews has made a perfect start to 2016, taking out the Paris-Nice prologue in his first race of the season. Matthews stopped the clock on the predominately flat 6.1km city centre prologue in a time of seven minutes 39seconds to take the victory and yellow jersey on day one of the WorldTour stage race. "It's my first race of the season so to beat a guy like Dumoulin who is one of the best time trial specialists in the world, it's definitely very special," said Matthews. "It wasn't really on the top of my goals list for Paris-Nice. I was hoping for a top five today to be around the guys and then try and take the yellow in one of the next stages. It obviously all came together and I am happy I was able to take the win. "We will take it day by day and now that I have the jersey we will just try and look after it for as long as possible." As Matthew's first race for 2016 sport director Laurenzo Lapage wasnt suprised with the world championship silver medalist's form, praising the 25-year old's professionalism in the off-season. "Michael was really relaxed and confident before the race," said Lapage. "Last year we did the same thing, he started here for his first race of the year." "With Michael we always know he is coming into races prepared and we expected him to possibly be in the top three, but it takes a special talent to win a prologue especially in the first race of the season. With Tom Dumoulin (Team Giant Alpecin) coming here as one of the specialists and Michael beating him, that says enough about his form." After taking the victory against tough competition, Lapage expressed how the win creates a positive start to Paris-Nice for the team and the rest of the season. "Today could not be better," he continued. "All the team had a good prologue, Daryl Impey had a strong ride, also Sam Bewley and Simon Yates, so we are very happy with the team performance today and it's a positive going into the next stages that's for sure." "There is a big chance of a bunch sprint tomorrow, we hope so and of course are going to control the race. I think the second part of the race we are going to have help from some of the sprinter's teams anyway." How it happened: After a downpour of snow from the previous day had cleared, the riders set off to the start line relieved but still facing bitterly cold temperatures. Things soon heated up as 175 riders one by one rolled down the start ramp to take on the short, sharp 6.1km course. Jérôme Coppel (IAM Cycling) set the fastest time early on with a time of seven minutes 48seconds. Over 80 riders finished but it no one could match his time and it was only until the final 45 riders took to the start that his time was eventually beaten. As the final few riders completed the distance, the gap between each rider was significantly close. Matthews' time put him one second ahead of Dumoulin in the closing stages to give him the victory and head into stage one as the race leader. Tomorrow the race proceeds with a 198km stage from Condé-Sure-Vesgre to Vendôme, the flat route has the potential to be a bunch sprint finish. Alberto Contador started his Paris-Nice in good form, finishing the opening prologue in a time of 7’55”, two seconds behind teammate Rafal Majka, Tinkoff's fastest finisher. The Spanish rider, who has won the race twice before, goes into the next stage looking to build on his strong performance in the opening time trial. The opening prologue took place over a 6.1km course in Conflans-Sainte-Honorine in north-west Paris. Covering a fairly flat parcours, there were a number of twists and turns that had the potential to catch riders out. All of the team’s riders crossed the line without incident, with Rafal finishing in 17th, with a time of 7’53”. Finishing 16 seconds behind the eventual stage winner, Michael Matthews (Orica GreenEDGE), Contador was confident about the coming days. “I lost time compared to most of the GC contenders but there are still so many kilometres ahead of us. The first sensations were good, we now have to take each day as it comes." The ‘Race to the Sun’ now moves to Condé-sur-Vesgre, where the second day’s racing will cover a flat 198km route with a gravel section and exposed roads. Sean De Bie has conquered the overall victory of the Three Days of West-Flanders. At the end of the last stage he had the support of teammate Tosh Van der Sande. At the start of the last stage, between Nieuwpoort and Ichtegem (182.7 km), Sean De Bie was fifth overall at twelve seconds of leader Tom Bohli who had won the prologue on Friday. Today’s stage started in the pouring rain and soon the peloton fell apart. Sean De Bie, Frederik Frison, Tosh Van der Sande and Jelle Wallays all were part of the first group, Bohli had to chase. The peloton finally came back together, but four riders remained at the head of the race. On the Kemmelberg the quartet got reduced to a duo: Dries De Bondt and Kenneth Vanbilsen. Fifty kilometres from the finish they got reeled in by a group with again the Lotto Soudal riders De Bie, Frison, Van der Sande and Wallays. Seven riders could escape from this new front group, De Bie and Van der Sande were in that new front group. Bohli didn’t play along for the overall victory anymore by then. Only Lukasz Wisniowski could take the victory away from Sean De Bie who had won two rushes, where he had gained three bonus seconds each time. In the last kilometres Tosh did all he could to lead Sean to the overall victory. Timothy Dupont won the sprint, Sean De Bie was second and Nils Politt third. Sean De Bie became the overall winner, with an advantage of seven seconds on Wisniowski. Lotto Soudal has won the team classification, both Tosh Van der Sande (7th) and Jelle Wallays (9th) finished in the top ten of the overall ranking as well. Sean De Bie: “After the finish I was disappointed at first instance because I had missed out on the stage win, but soon I realized I had won the GC and of course I am over the moon now. In the sprint I maybe was too much focussed on Wisniowski who was only one second behind me on GC and whom I had to look out for. Cannondale Pro Cycling Team scored its third win of the season when Simon Clarke soloed to victory in Larciano to win GP Industria & Artigianato on Sunday. A strong team effort netted Clarke the victory on a day that saw four Green Argyle riders finish in the top nine. Earlier in the afternoon, Paddy Bevin put in a brilliant performance on the opening stage of the Paris-Nice. The Kiwi time trial champ powered to third place with a time of 7:41 over 6.1km in the Conflans-Sainte-Honorine prologue. Michael Matthews (ORICA-GreenEDGE) won by one second over Tom Dumoulin (Giant-Alpecin). Bevin was a mere two seconds off the winning pace. 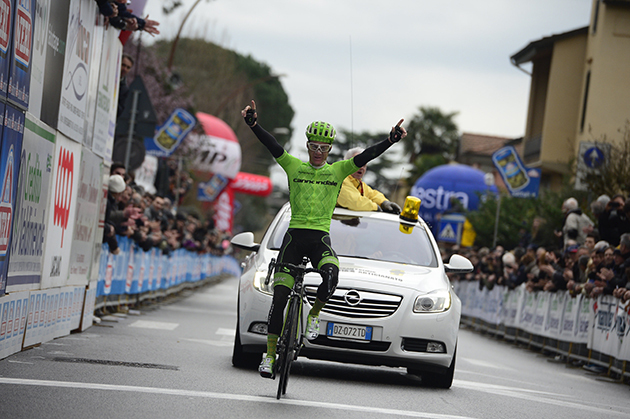 Ramunas Navardauskas set the scene for a Cannondale Pro Cycling Team victory in Larciano when he made the early selection. The Lithuanian champion flew the Green Argyle flag in an escape of 20 riders at the start of the 200-kilometre day. The peloton struggled to catch the breakaway riders when they began to chase. It took a concerted effort by Astana to close the gap. With the breakaway’s advantage waning, Ramunas set off alone. By that point, Navardauskas has spent nearly 200-kilometres at the front, but Clarke was confident in his teammate’s ability to help him get a gap over the reduced bunch. Clarke had 20 seconds over the peloton at the top of the climb. There were 6km remaining – a 4km descent followed by a 2km flat run-in. “I only needed to hold it to the finish,” said Clarke. Clarke didn’t just hold the gap, he stretched it out even further, crossing the finish line 33-seconds ahead of a trio of riders including teammate Rigoberto Uran. First WorldTour race in Europe. First WorldTour podium. Bevin delivered a blistering fast ride in the 6.1km Paris-Nice prologue on Sunday to finish in third place against a field in which nearly 20 riders were expected to contend for the top-three. The Kiwi time trial champion said he’s delighted with the effort. Lampre-Merida was looking for interesting feedback from its young talented riders and they had a good result from Simone Petilli. The 22 year-old Italian climber obtained a place in the top 10 for the first time in this season, reaching the arrival in 9th position in the second group of chasers of the winner Clarke. The gap of Petilli from the Australian rider, who obtained a solo victory, was of 43". Cold and rainy day in Larciano, however the riders were not discouraged and they began immediately the battle after the start. Twenty cyclists escaped from the bunch in the early kilometers, there was too the blue-fuchsia-green jersey of Mattia Cattaneo; unfortunately the cooperation among the attackers was not good, so the breakaway was soon over, except for four athletes who counter-attacked and could had a maximum advantage of more than 7'. Behind them, the situation in the peloton shifted several times in the second half of the course, when the riders covered the four laps of the San Baronto circuit. The key moments for the selection of the bunch were the downhills from San Baronto to Larciano: at each passage, the peloton was reduced to no more than 20 riders and Lampre-Merida was always present thanks to Mori, Ulissi (despite the efforts made on Saturday in the Strade Bianche), Cattaneo and Petilli. This latter rider was brilliant enough in the final lap of the San Baronto circuit to be in the chasing grouop of Clarke, who attacked on the climb. Petilli used the left energies to obtain a place in the top 10, his team mate Mori was 26th.